I got Kona home Monday night after over hundred long miles of contemplation of how it was going to go when we finally got home. I was nervous, apprehensive, excited and having more than little buyer’s regret. When we got home, Lauren was off caring for a friend’s horses and was not there to greet us. First, I had to get my dogs out of the house and get Kona in, without having a huge dog fight erupt. I did not know if it would or not, but I have had dogs in huge fights before and the outcome is often swift, brutal and bloody. The two dogs most apt to start the fight were the two rescue dogs, Muffy (the black and white spaniel mix found near frozen in the corn field) and Browndog, ( a brown lab and Australian Shepherd mix) whom Jordyn spotted behind our arena the year of the great drought, horrendously thin and needing a home. These two dogs came from hard times, are more nervous and can become nippy if crossed. I managed to get the dogs all fed (all outside at their usual stations) except PuppyGirl and Kona whom I separated indoors until I would know how the dogs would get along. Kona had come with his own high dollar dog food made from Salmon and including blue berries (anti-oxidents, you know). When Lauren opened the bag she said it smelled like a million dead fish. But Kona loved it and ate it hungerly. Introducing dogs is hard enough but you do not add the element of food. Then, on the leash, Kona and I went off to investigate the horses for the first time. We got just outside the gate, when Kona realized something was a miss. He got wind of the horses and the horses got wind of him. He immediately started barking in a deep resounding bark while braced against his front legs in case he needed to whirl and run. Mickey and Feather did not smell or see “dog”. What they saw resembled an ape or a bizarre hedge hog and what they smelled was a floral scent from the grooming powder and shampoo. Feather raced to the back of her stall. Mickey stood his ground at the front of his but was puffing and blowing at the weird animal in front of him. 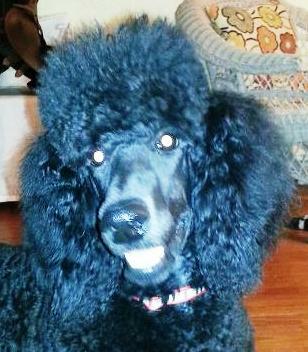 In my head, I thought, oh boy, isn’t this gonna be a great horse show dog! But each time I went back out to water and then to hay, Kona came along. By the third trip he was quiet, relaxed and looking for some horse poop to eat. Good progress! Inside the house, things were going a little slower. Kona was not a threat to anyone, but he was acting like the exuberant puppy that he is, jumping, posturing and giving happy barks to invite the other dogs to play. By bedtime, he, Muffy, Lula and PG were tolerating each other. I finally laid down to read on my bed with the three existing dogs on the bed with me. I had quickly learned that Kona had been taught not to get on the furniture and it seemed like a good rule to keep enforcing. I put Kona in his big kennel and we all settled in. I turned of the lights. Kona started barking. His barking engaged the dogs in Lauren’s room and it got pretty rowdy. I yelled at him. Still barking. Turned the light back on. He goes quiet. I have no idea where his kennel was before (in a garage, a cave, in the pool house) but in my bedroom it was going to be a problem if I could not have the lights out and quiet. I turned the light out again. The barking started in full force. I was tired, stressed and scared I had bought the hound from hell. I put my ear plugs in (used last time to block out the giant cat mating under my house session), turned on a fan and eventually he quieted down and slept. My goal for the next day was by day’s end to have all the dogs out together in the fenced back yard. It seemed like it was not going to be easy. Meanwhile, Lauren saddled up Feather. Kona and I headed to the arena behind them to see how a horse moving was going to effect him. We have a horse show this weekend and Kona cannot go and bark at all the horses. Keeping an eye on Feather but not offering to charge or chase her. He has ball in his mouth. By the end of the evening, we were going to barn without incident and the backyard full on new sisters was going okay as well. The best part of ending day 1 of Kona’s first day on the farm? I put him in his kennel, turned out the lights and we quietly went to sleep. I had a “Golden Poo” for eight years (far too little time) and she was a marvelous dog. 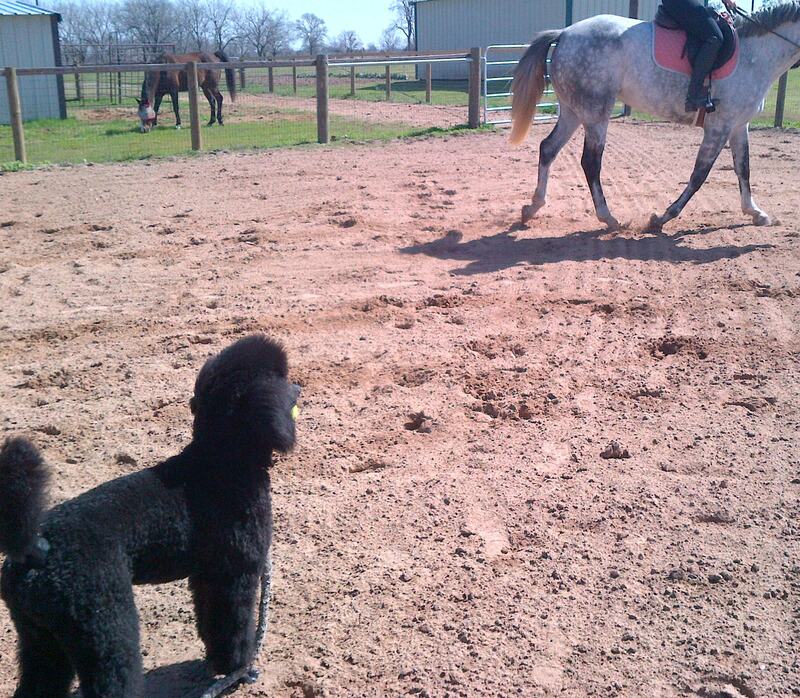 She had the brains of the Poodle and was a glorious “ranch dog”–she didn’t chase the horse either, but she loved racing around the outside of the round pen when he was doing HIS thing. I envy you Kona.